Which Princess Lodge should you stay at this summer? Now that winter has arrived, it’s time to pour yourself a mug of hot tea, settle in by the fire and start planning your next grand summer adventure. If a trip to the Last Frontier is in your future, it’s not too soon to start deciding which Princess Alaska Lodge you should book with. We hope this short quiz will help make your decision a little bit easier! 1) You wake up feeling well-rested and energized and rise out of bed to pull the curtains back. What would you like to see out your window? 2) Which activity is at the top of your Alaska bucket list? 3) After visiting some of Alaska’s most scenic sites, which meal sounds like the perfect way to end the day? 4) Which Alaska animals are you most excited to see? 5) You’ll find no shortage of treasures in Alaska to remember your trip by. Which one of these souvenirs most appeals to you? This lodge is situated in the Kenai Fjords National Park and offers cozy, bungalow-style rooms with wood-burning stoves and private porches. The gorgeous Kenai River provides plenty of opportunity for adventure and available excursions include nature hikes, fishing, rafting and historical tours. Located just a mile from the entrance to Denali National Park, this wilderness lodge is an ideal place to stay when visiting Alaska’s interior. Activity options are plenty, including exploring the park on an ATV, enjoying a local theater production and embarking on a flightseeing, fishing or rafting tour. 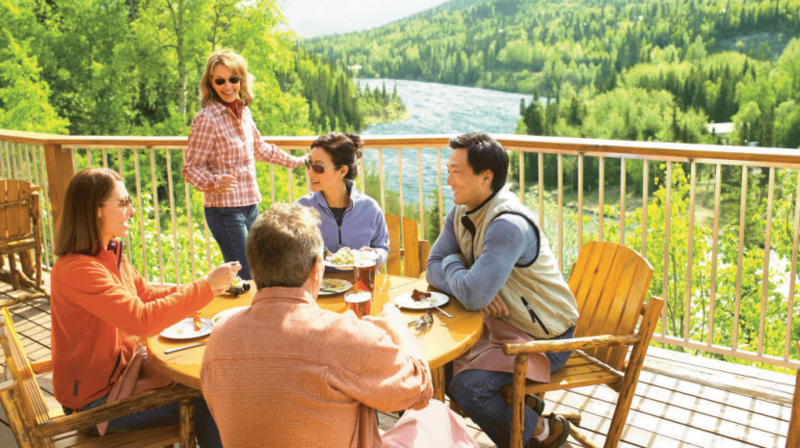 At the end of the day, kick back on the porch and gaze out at the scenic Nenana River. Enjoy Alaska’s Golden Heart City in style at our Fairbanks lodge, with easy access to the airport and railroad depots, shopping and a wide array of adventures. Enjoy a day exploring the Chena River by riverboat before dressing up for a night on the town. The choice is yours, but make no mistake – opportunity abounds here! If you’re coming to Alaska for mountains, look no further. With floor-to-ceiling windows in the lodge’s “Great Room,” this is the place to be for some of the best views of the tallest mountain in North America. Take a day trip to the quaint town of Talkeetna for a zipline adventure or enjoy a homestead tour to learn about the lifestyles of Trapper Creek’s early pioneers. Located in Wrangell St. Elias National Park, this lodge offers expansive views of the Alaska wilderness. Visitors can explore the abandoned Kennicott copper mines, take a glacier cruise in the breathtaking Prince William Sound or spend the day sea kayaking.